"Hiram L. Leonard, Gunsmith and Fisherman "
An image scanned from a black and white photograph of Hiram L. Leonard of Bangor, Maine, and Central Valley, New York. 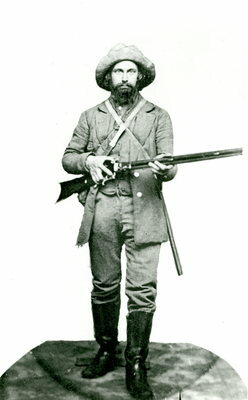 Leonard was a gunsmith in Bangor during the 1850s and 1860s and was a well known hunter who frequently guided parties of hunters into the northern Maine woods and is mentioned in Henry David Thoreau's In the Maine Woods. He conceived a way to construct split bamboo fishing rods in the 1870s and became known throughout the world for his rods. He left Bangor in the early 1880s and moved to Central Valley, New York, where his rods were manufactured for many years.